The Swedish International Development Cooperation Agency (Sida) was launched in 1965 as the Swedish International Development Authority and remains known by its original acronym, Sida. Today, it works in 36 countries as well as at regional and global levels, with the goal of reducing poverty and creating better living conditions for people living in poverty and oppression. Sida administers about half of Sweden’s total development aid budget with the other half operated through the Ministry for Foreign Affairs. Media development is primarily either a small part of the wider concept of Freedom of Expression at Sida, or of the wider area of democratic governance and rule of law. “There is an interesting discussion now on useful methods to meet the complex challenges, which theoretically opens up for more support to the democratic structures that shape the space for media and qualitative journalism,” a Sida staff member told CIMA. In 2017, Sida increased support for freedom of expression programs as well as its funding for democratization and rule of law programs. A supportive media environment can be thought of as the center of a triangle with these three elements, which influence each other, at the corners of the triangle. 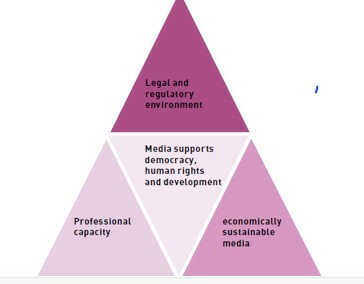 In addition, these three sectors in an operative media environment are also influenced by cross-cutting topics, in particular human rights, ICT, gender equality, and safety. Sida’s priorities in support of media development then can be considered to address a variety of development issues. In 2016, Sida allotted approximately $42 million (330 million Swedish Krona) to media development programs and another $3.2 million (25 million Swedish Krona) to media development programs run by multilaterals, such as the United Nations and UNESCO. These figures do not include additional Sida support to freedom of expression and media activities performed by thematic interest groups. Sida’s funding of media development programs was estimated to be two to three percent of its total civil society organization support in 2016 and less than one percent of its support to multilaterals. Sweden has supported the media sector in Zimbabwe for over 20 years, and since 2012, the Swedish Fojo Media Institute has managed the Media Development program. Working with five local partners in the project’s implementation, Swedish Fojo Media Institute addresses the lack of freedom of expression and access to information due to restrictive legislation, community radio restrictions, a gender imbalance in the media sector, and journalists’ poor working standards and conditions in the country. In November 2016, the Media Development Investment Fund (MDIF) announced support from Sida for its new MDIF Media Finance I, a blended-value loan fund for independent news media companies in select emerging and frontier markets, such as Myanmar, Ukraine and Malawi. The MDIF fund, financed by Sida, will provide up to $6 million in affordable debt to small- and medium-sized media enterprises with high social impact. It will provide investors with 55 percent first-loss protection and four percent annual interest and high mission impact. The loans will finance investments in software, equipment, content production and work-space, as well as working capital and short-term cash-flow needs. Through the loan fund, Sida also will offer grants for technical assistance, enabling MDIF to provide strategic advice and management capacity-building services to help investees optimize their businesses. The goal of Sida’s supported CIPESA project is to enable more East African citizens, especially marginalized women, youth, and rural poor, to participate in governance processes, have improved human rights, and greater government transparency and accountability. Working in Kenya, Tanzania and Uganda, the so-called ICT4Democracy in East Africa Network promotes freedom of expression, right to information, effective public service delivery and equality through ICTs. The network has seven implementation partners. Through network building, mentoring and skills transfer, the project also aims to develop the ICT4Democracy in East Africa into a sustainable network of civil society organizations, media and citizen groups that use ICT towards open government, free speech and equality. 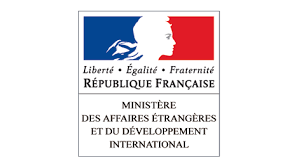 Other project focus areas include online rights, open data, and the right to information.